← That Guy’s Ruining a Perfectly Good Game of FOOTBALL! Well guess who were the templates for Kusenagi and Batou? None other than Deunan Kneute and Briareos Hecatonchires. Admittedly, the word “template” here is actually quite misleading. Shirow didn’t simply lift characters from one work and slap them onto another. The same way how Oshii’s take on the characters is different from Kamiyama’s and so on, so forth. The focus, however, is on the dynamics between the characters. In this case, between Deunan and Bri. Granted, Deunan is no Motoko Kusenagi. However, the fact remains; she is the original Point man. She is supposed to act the part while Bri’s character is supposed to be her counterpart. 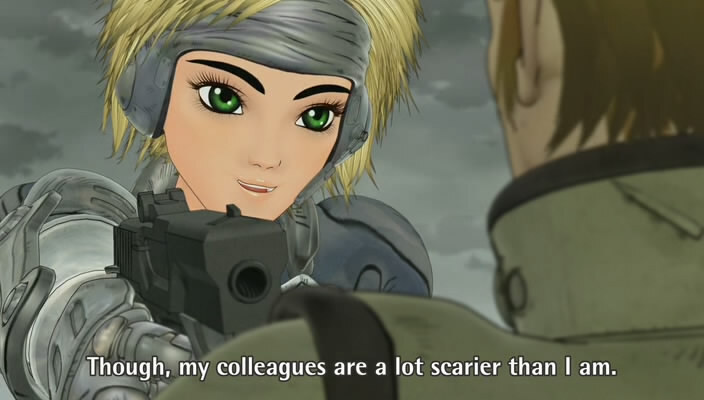 Unfortunately, this does not seem to be the case in Appleseed XIII, at least as it stands right now after two episodes. The creators might have opted to take a different route with these characters, which is perfectly fine by me. I’ll be eager to see what they do. Of course, the flip-side of it is they actually do intend to keep the character dynamics in-line with Shirow’s original templates and are just failing at it. In which case, I’m less eager to find out what happens. Since when do you have a Point man who cries every five seconds while off-duty and has to constantly rely on support during combat? Dear Lord I hope they don’t take the confidence angle of approach with Deunan. I’ll contemplate dropping this, if only for a moment. Deunan: Is it on Autopilot? Deunan: Is it a bomb? Deunan: What should we do? Deunan: So, what’s the plan? Whoever writes the scripts for this show sure strives for brevity. Since dialogue plays such a huge role in characterization, stuff like this really seems to indicate the opposite of what I had in mind. One aspect that struck me about Shirow’s Deunan is that she remains one step ahead of Briareos. A character element which opened up moments where she had to slow down, a path to development if you will. She’s a weapon. A reckless one at that. One who feels not necessarily threatened by Olympus, but rather caged. This incarnation of Deunan is indecisive. She lacks a sense of “natural” flair that no amount of vacation outfits, cheeky CGI pouting, or childish banter can make up for. Aside from that, the story is still very much in set-up mode. There’s not much else I can say. Damn, it feels like it’s been forever since the first episode. This entry was posted in Appleseed XIII and tagged Appleseed XIII, Koichi Yamadera, Maaya Sakamoto, Production I.G., Shirow Masamune. Bookmark the permalink. 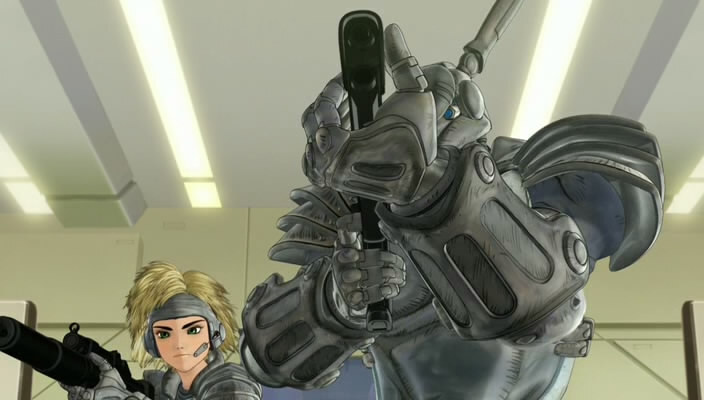 Pingback: Anime Review: Appleseed XIII Episode 2 | This Euphoria!